http://www.superteacherworksheets.com/index.html. I’ve also written fiction and nonfiction passages for the education market. I love sharing stories with my children and students. We are always looking out for a story, book, poem, or song that makes a difference in our lives. Some other things I enjoy are reading, spending time with my two daughters, watching football, practicing Yoga and Tai Chi, drinking tea and being outside. My favorite TV show is I-CARLY. Yes, I’ve suddenly found myself watching it myself, laughing, and my daughters have left the room. I admit to being a Star Wars nerd too. Friends and family shake their heads. “There’s another Star Wars book?” “Yes! There’re hundreds. Now let me tell you about the one I’m reading…” They are sorry they asked and quickly disappear. Finally, my lost love, the 1800s and the west, I’ve seen all the Clint Eastwood movies and read a lot of Larry McMurtry and Louis L’Amour novels. I also love non-fiction about this era. I was born north of Pittsburgh. I live with my beautiful wife and two wonderful children in Washington State. Which book are you currently promoting? I’m currently promoting Broken Bridges. Twelve-year-old Rey is sent to an old rundown steel town near Pittsburgh, where he has to deal with his aging grandparents, isolated dad, missing mom, bullies, broken bridges, and horseradish sauce. While Rey sits on an airplane bound for Pittsburgh, he clutches a crumpled note. It’s been forty-one days since his mom left – no word since. Rey is being sent to Pittsburgh for the summer to stay with his grandparents, so his dad can pull his life together. Rey is timid, unsure, yet has to make choices. These choices lead him to become more confident, as he makes the transition from child to teenager. Arriving in the middle of a heat wave he quickly runs into trouble with bullies and is in several difficult situations. Through it all he finds a true friend, Jason and discovers a mentor in his grandfather. Both bonds are put to the test when his grandfather becomes extremely sick and Rey has a final confrontation with the bullies. And then there are his parents. What can you tell us about your main characters? Some of this is covered in the synopsis. I’ll try and go into a little more depth. The story is told from twelve year old Rey’s perspective, his slice of life. Rey starts the story unsure and insecure. At first, Rey is not looking forward to staying the summer in a small, hot, run-down town with nothing to do. Rey deals with situations with humor and determination. It’s his summer of growth. His grandpa, Pap, becomes his mentor who has faith in him. Pap tells stories to Rey that make him laugh and think. Writing about Pap, reminded me of my own grandpa. I remember my grandpa had faith in me and always had a story to tell. That’s what I wanted him to be for Rey. Rey’s friend, Jason is pretty angry. Jason’s determination seems to get him and Rey into trouble. Yet they are good friends and balance each other out. Jason’s story is one that I’m working on. Rey’s grandma is sort of the stabilizing force. She uses reason. His grandma is big on memories, especially happy ones. As a teacher, I read a lot of books. I started out writing for my students or writing stories they could read and enjoy. The more I wrote, the more I enjoyed it. A few years later, I took a course at The Institute of Children’s Literature and joined The Society of Children’s Book Writers and Illustrators. As I read and wrote more, it just became part of who I am. I just found I had stories to tell. Do you have a general idea of what direction you want the plot to take ahead of time? I usually have a starting point even if it’s just backstory. Sometimes I have some sort of ending too, I usually then take the story from there. With Broken Bridges, I had the beginning, the end, and some of the middle. In the beginning, I cut a lot of the backstory and weaved some of it throughout the novel. The ending, I added some stuff and made sure everything came together. For the middle, I added and made connections with the other parts of the story. Have you ever had second doubts about a story you’ve written? I’m currently submitting a picture book, written in verse, to publishers and agents. I’m also getting ready to submit a text for a graphic novel. I started to write a sequel to Broken Bridges. Right now I’m writing it from Rey’s friend, Jason’s perspective. 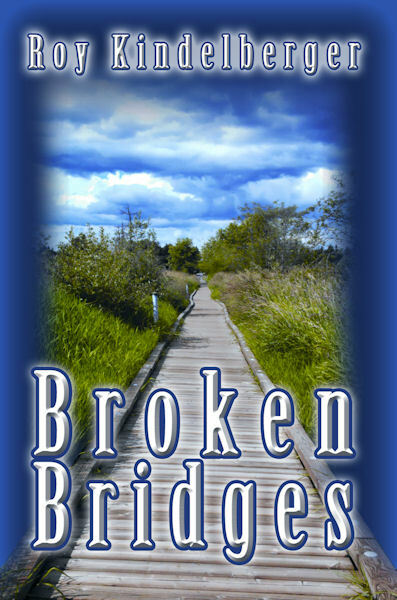 The first chapter is in the eBook version of Broken Bridges. A lot of my time right now is with promotion and teaching a new grade level (2nd). I started writing for my students in 1999. I started to write for publication in 2003. My first story was published in 2007. It was a short story about a little girl, who blamed things she did on her imaginary friend, Jingo. I’ve been fortunate to publish something in each of the years since. Is there anything else you would like to tell us that we have not already covered? 3. If you were stranded on a desert island, what is one thing you couldn’t live without? My first answer would have been my Kindle but how would I keep it charged? My second one was water, but I thought that wasn’t very exciting. So I chose a book that I read five times in one year. I’m sure I’d find plenty of time to read it while stranded on a desert island. The book would be Star Wars: Traitor, by Matthew Stover. It doesn’t star any of the main characters from the movies. Instead, its main characters are Han Solo and Princess Leia’s son and a long lost Jedi. I’ll stop there with my Star Wars ramblings. This is an interesting one. My kids and students think I’m funny, and many adults think that I think that I’m funny. The teacher: Rolls his eyes, laughs and tell me to go away. My daughters and students laugh at many things I say whether it’s meant to be funny or not. I’m just a big kid. 5. Tell us something that you did that might be considered dangerous.